That is $4,685 worth of software and firmware options making the total price $7,885. The receiver has worked great and you have used it two or three days every week and have few complaints. But last week, Bozo Navigation released a new model, the MapWiz 220. It tracks Galileo, Compass, L2C and L5; plus the processor is faster and the screen is easier to read in sunlight. The MapWiz 220 is the same price as the MapWiz 200, but your firmware and software will still add up to $7,885. You would love to upgrade, but that is a lot of money and while you are checking out the new ‘Bozo Navigation’ device you see that their Chinese competitor ‘HighClown GNSS’ has a very similar device for $6,120 that includes everything. If you purchase the HighClown device, then you can keep your existing MapWiz device for a backup while upgrading to the newest tracking technology. Obviously, the HighClown receiver is the way to go. However, what if BZN (Bozo Navigation) allowed you to return your MapWiz 200 and then transfer your existing options to a new MapWiz 220? Then the 220 would be the way to go. You would be “trapped” into staying with Bozo Navigation forever because your options were transferable. And $3,200 every three years would be a small price (indeed) to always have the latest GPS technology. When you purchase a GPS receiver, you expect it to do what the data sheet says it does. However, your expectation needs to be tempered by OPTIONS. This is the way that most GPS companies work. That some companies do it, makes other companies have to follow suit because they have to compete. Consider you are purchasing a reference station to use in a real-time-network. You could care less about most of these options. All you want is GPS, GLONASS, L2 and base output. And and by they way, you are going to purchase 1,200 base receivers in 2014 alone. Guess what? You are going to pay about $4,200 per receiver for each network base. And it may be reasonable that you don’t have the rest of the options. Totally reasonable. You are purchasing BASE receivers and don’t care about RTK rover capabilities and enhancements. If there are any additional options, I don’t know what they are because I can’t purchase them. The SP80 is available with and without a internal UHF radio module in the USA. That’s it. There are NO software options. None. Everything is enabled out of the box and ready to go. Let’s hope this is a growing trend. I think it is good for the purchaser. Good surveying and mapping to you! Please Note: the following is going to upset equipment manufacturers and I am going to take heat for having said it. If you are a manufacturer and you don’t like what I am going to say, let me disclose that if you complain to me, I will put your complaint (written or verbal) as an addendum to this post, exposing you (personally) and your company as the third-rate hacks that you will have proven to be. The best way (and I will argue the only way) is if the software tool is ‘Code Signed’. Code signing computes a complex numerical key for the software and appends the key to the code. Through a series of public/public keys, you can be reasonably assured that the code was created by the device manufacturer. You can read all about code signing and implementation details at Wikipedia [ here ]. you should NEVER, EVER run a downloaded file that does not have a verified publisher. Ever. Now, why is this important and why am I sounding this alarm? The file may have been compromised during the download process. If you have a virus on your computer, the virus may modify the file when it is saved to your drive. The file may be completely bogus or a partial download. If the code is properly signed, then you can be sure that it has not been modified since the developer (the signer) made it. If the code is not signed, then you can not be positive that the download is what you think it is. 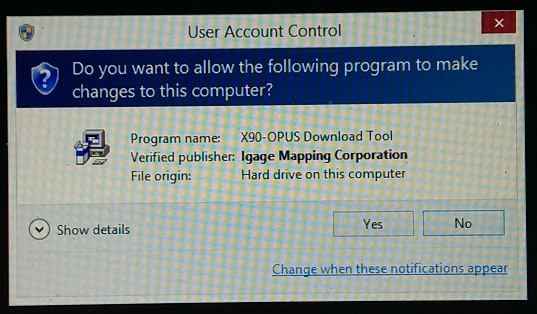 You SHOULD NOT INSTALL OR RUN IT. Often, when software is installed, it will generate a positive hit with an anti-virus solution. 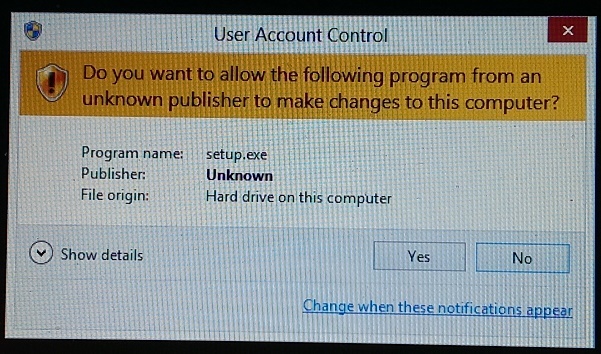 The question always occurs “Is this the EXACT same file that the manufacturer distributed, or has the file been modified by an existing virus on the user’s computer.” Code signing solves this problem. How Does a Manufacturer Code Sign? 2. Developer applies the certificate to code (it takes a few seconds) and enters the secret password to ‘sign’ the executable. A special secret key must be installed on the computer where the code is signed. A manufacturer can purchase a certificate and use the same certificate to install software from multiple machines (I have four machines that I routinely sign code on.) You only need the private, public keys and the password. What are the risks of a manufacturer not signing code? The big risk is the file is compromised (perhaps after you download it to your computer) and you install a virus on your computer or pass on the virus to a friend or office mate. A lessor risk is the file is incomplete or damaged and won’t work. What excuse could a manufacturer make to not code sign? There is no excuse (period). Either way, you should purchase your survey equipment elsewhere. The lack of consistent code-signing from a software developer is the sign of a software process that is out of control, run by idiots and supervised by hacks. That big companies proffer software tools and updates without code signing is a sure sign that you DO NOT WANT TO DO BUSINESS WITH THEM. ps: if you are a manufacturer and need help implementing code signing I will help you. It will make the world a better place, I am all for that. Just don’t argue that it is un-needed or not irresponsible.